A high-tech hand recently showed up at a Las Vegas pawn shop and one man is desperate to get it back to its owner. Watch 13 Action News at 6 p.m. for the full story with Joe Bartels . The Touch Bionics i-Limb hand is not a movie prop, not a toy, but a life-changing device. "It was marked down as $200, and had collectible on it, it's a hand, it's not a collectible," Reggie Wing said. Wing was visiting a pawn shop recently, looking for tools, when he stumbled upon the unusual item. "I thought about it. That's somebody's hand," he said. "And I asked the girl about it, who's is this? Why did he bring it in here." Wing says employees at the shop on East Charleston Boulevard told him that a man with a hook for a right hand pawned the device for $50. But when he came back, he didn't have enough cash and so the item went up for sale. "And it bothered me that he couldn't get it back out that's his hand," Wing said. So he bought the hand to return to the owner but Wing ran into problems. He says the pawn shop, citing confidentiality and store policy, couldn't give the name of the owner and could not hold the item for the owner to retrieve. Wing then turned to 13 Action News. We reached out to Touch Bionics, headquartered in the United Kingdom. 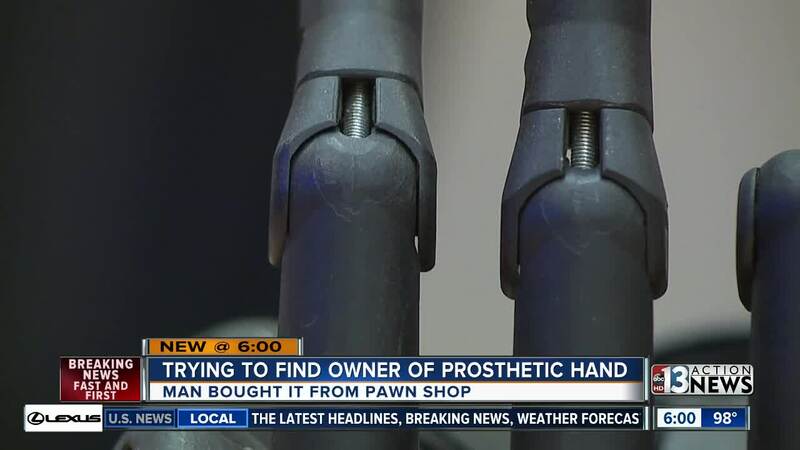 Using the unique serial number, the company said the hand was purchased by an organization called Hanger, Inc. , a leader of prosthetic care based in Florida. A spokesperson told Contact 13 they were unable to track down the owner, leaving the hand and Wing with a big mystery. 13 Action News hosted a Facebook Live in hopes of finding the owner. If you think you know who the hand belongs to, send us a Facebook message.